The science media is abuzz with claims that scientists at the world’s largest particle physics lab (CERN) have observed subatomic particles traveling faster than the speed of light. If this observation is confirmed, it could deal a severe blow to Einstein’s special theory of relativity, which has an enormous amount of experimental confirmation. However, the first part of that previous statement is really, really important. These results need to be confirmed, and I am rather skeptical that they will be. Even if they are confirmed, however, they don’t necessarily mean that special relativity is incorrect. That’s probably the most overlooked part of the story! First, you need to know that the particles being studied are called neutrinos, and they are maddeningly hard to detect, because they don’t interact strongly with matter. In this experiment, the neutrinos are detected by an underground system called OPERA (Oscillation Project with Emulsion-tRacking Apparatus), which is made up of about 150,000 bricks of photographic emulsion film stacked in between lead plates. The mass of this system is 1,300 tons. It sits 730 kilometers away from the source of the neutrinos it is detecting, and those neutrinos generally take about three thousandths of a second to travel from the source to the detector. The scientists have published an initial version of their paper, and it is impressive. Most importantly, they seem to have taken great care in keeping track of time in their experiment. After all, if the scientists are going to measure the velocity of the neutrinos, they need to know when the neutrinos are made and when they reach the detector. The difference between those two times tells them how long it took for the neutrinos to travel from source to detector, which then allows them to determine their speed. Measuring those two times is a bit tricky, however. Even though they took great pains to measure the times as well as they could, I think that’s the weak point of their experiment. Think about it. They need to know when some particles that are 730 kilometers away were formed and when they reached the detector. How do they correlate two things that happened 730 kilometers apart from one another? Well, they use both a Global Positioning System signal and an atomic clock. Using both of these time-measuring devices in tandem gives them (theoretically) the ability to measure the neutrino travel time to within just a few billionths of a second. Now remember, the neutrinos take only about three thousandths of second to get there. However, if the system really is able to measure the time to within a few billionths of a second, there should be no problem. So, assuming everything is working as expected, what did they find? They found that the neutrinos arrived at the detector just slightly earlier than light would have arrived there. Specifically, light should have taken about 2.4 thousands of a second to get to the detector, but the neutrinos got there 60 billionths of a second sooner. That’s not a lot, but according to their detailed analysis, the system’s total error is about 14 billionths of a second. Thus, the time by which the neutrinos “beat” light is much larger than their maximum error, which makes the measurement something that must be taken seriously. Despite the large significance of the measurement reported here and the stability of the analysis, the potentially great impact of the result motivates the continuation of our studies in order to investigate possible still unknown systematic effects that could explain the observed anomaly. So while the result is important, even those who came up with it are still looking for some effect other than faster-than-light travel to explain it. Thus, if these results are confirmed (which I doubt) we know there is something wrong with our current understanding of physics. What exactly is wrong, however, remains to be determined. Of course, that’s what makes physics phun! Very nice, Jay. Thank you for explaining a very interesting and difficult potential result. How exactly do they measure the time elapsed? I don’t understand how they can either synchronize the clocks at both ends or signal the destination to start timing given that the signal would be traveling slower than the speed of light? calibrated by the Swiss Metrology Institute (METAS) and established a permanent time link between two reference points [the reaction and the detector] of the timing chains of CERN and OPERA at the nanosecond level. This time link between CERN and OPERA was independently verified by the German Metrology Institute PTB. Very interesting article :)Keep us updated! Thank you for providing logical, scientific information about what I have been hearing so much about lately. Yes, Thank you for your comments but I think the light is become very distractions in particle physicist? Good article. It’s been a while since I was in school, but I seem to recall that while Special Relativity doesn’t necessarily forbid faster-than-light travel per se, it does lead to some startling results. One of which is that since tachyons would have spacelike trajectories in spacetime, two events A and B in which A happened before B in the tachyons frame of reference could happen such that B happens before A in another frame of reference (going the opposite direction as the tachyon, if memory serves.) This means that, assuming tachyons could relay information (as seems a fair assumption) that someone could then send messages into the past (granted, only in certain reference frames.) Doesn’t this pose a huge problem for the existence of tachyons? On the other hand, if these results are correct then tachyons look a lot like neutrinos, so maybe their inabilty to interact with ordinary matter very strongly means that they cannot act as information carriers? Thanks for your comment, Jason. If a particle can interact with a detector, it can be used to send information. So even though a neutrino-like particle is difficult to detect, it can be detected, and that is enough to allow it to serve as an information carrier. Interestingly enough, the problem you suggest is only true in one interpretation of tachyons. The Feinberg reinterpretation principle says that it is possible that detecting tachyons sent backwards in time produces tachyons that travel into the future. Thus, detecting a tachyon from the future can actually create the same tachyon in the future. If that’s the case, then all reference frames still see the laws of physics working properly. Obviously, this is all very hypothetical, but it at least makes it possible for tachyons to exist and not violate the relativity principle (that all reference frames see the same physics). Basically, superluminal neutrinos would radiate electron/positron pairs in the time it would take them to travel the distance between CERN and the detector. I don’t know enough field theory to say whether this makes sense. I do know that one of my friends was trying to write the same paper, but Glashow beat him to it. Jake, I am not an expert in field theory by any stretch of the imagination. However, I can say that their argument seems correct, assuming standard physics. I think what someone who wants to believe in the OPERA results would say is that if standard physics were correct, you would not expect the observed result. Thus, to really show that the observation is wrong, you can’t use standard physics arguments. You need to explain how their time measurement is incorrect. Faster than Light is an Interesting possibility. Looking for an answer/s to my questions. I have a few lay person questions. How do we know if the particles that are created by the bombardment through graphite(?) 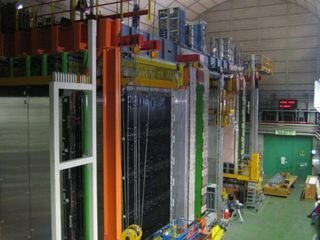 are the same particles that are arriving at INFN? Is it possible that neutrinos travel easily through dense matter, but when traveling through streams/pools of other neutrinos they collide like a marble/s being shot at a pile of marbles and some are displaced, ricocheting with increased speed in the same direction and pattern as the ones being fired? please excuse if my language or concept is naive or absurd? I see this in my mind and think the entire universe is connected like a ‘String of pearls’ and when one pearl is displaced it immediately displaces another/others along the same line thus appearing to be faster than light. Excellent question, Isaiah. First, we know that the particles are at least correlated with the bombardment of graphite, because when the bombardment stops, the neutrino response from the detector stops. Second, the reason neutrinos are maddeningly hard to detect is that they do not interact with matter very strongly. As a result, it is hard to get them to collide with anything. Because of that, getting two neutrinos to collide with each other is even harder. Thus, the idea that the neutrinos produced in the bombardment collided with other neutrinos in their path to produce a response in the detector doesn’t seem to make sense based on what we know about neutrinos. More importantly, if your idea is correct, the results are even more stunning. If there were some string of neutrinos, and they had to displace each other to get to the detector, that would actually use up energy. So imagine a “race” between a free neutrino and a string of neutrinos. If I give both starting neutrinos the same energy, the free neutrino would get to the detector first, because it wouldn’t waste energy interacting with a bunch of other neutrinos. My bet is still on some sort of technical issue that no one has considered yet. However, the paper has been peer-reviewed, and the reviewers couldn’t find a problem with the experiment.